This post explains basic things about bicycle rear hubs, i.e. rear bicycle wheel hubs. Rear bicycle hub has one main role, that is allowing the wheel to turn freely, while keeping it attached to the frame at the same time. Also, unlike the front hub, the rear hub has another important role: transferring driving force of pedalling to the rear wheel (usually, but not necessarily through chain and rear sprocket). They consist of an axle, bearings and a body that has wheel spokes attached to it. There is also at least one sprocket for transferring pedalling power to the rear wheel. Three basic hub types are one geared (single speed, or even fixed gear) hubs, internal gear hubs and external derailleur hubs (with cassettes). The basic hub design. Power is directly transferred to the wheel (hub body) from the attached sprocket. It often has coaster brake installed. Since there is (by default) no external chain tensioner, it is often mounted in a frame with horizontal dropouts, which allows for chain tension regulation by moving the hub front and back. This model has threads for screwing two sprockets – one on each side. This allows for two different speeds, but in order to use the other, chain needs to be taken off and the wheel turned. This one also has offset mounting bolts, so that chain can be tensioned even on frames with vertical dropouts. Pictures of frame dropouts that are, and that are not well suited for single speed hubs. 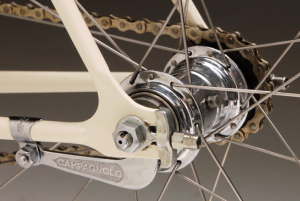 Single speed hubs can be used on frames with vertical dropouts, if they have off center mounting bolts (like the hub in the picture above), or if an external chain tensioner is mounted. Good solution for modern frames with vertical dropouts. These hubs often come with coaster brake. By turning pedals backwards, braking force is activated. A good solution for leisure riding in flat land areas. Special subgroup are fixed gear hubs. These hubs don’t allow coasting – whenever the rear wheel is turned, rear sprocket runs also. It is fixed to the hub body. Advantage is the opportunity of riding backwards. The flaw is that pedals keep turning, even when that is not convenient (avoiding obstacles, or a fast downhill ride). These hubs are practical for shorter distances in flat land areas. Their main advantages are simplicity, durability and low cost. They also have one sprocket and all the limitations of mounting singlespeed hubs also apply to these hubs. They have a long history, from the beginning of the 20th century and famous English three speeds. Today most popular models have 7-8 speeds. The gear changing implementation is a topic for another blog, but the important thing to know is they allow gear changes when completely stationary, no wheels spinning (e.g. while stopped at a traffic light). Gear changing mechanism is well protected from the elements, packed inside the hub body. This makes internal gear hubs good choice for very wet, or very cold conditions. This is a system that allows changing gears in temperatures lower than -15 degrees Celsius. Thin chain comes out of the hub, pulled by a cable. It is used to change gears. Main drawback of these hubs is harder servicing and harder, more complicated wheel dismounting (when fixing a flat etc). 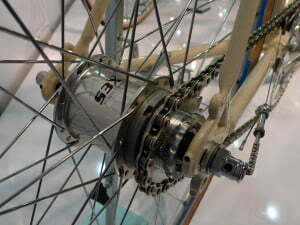 Freewheel with threaded hub and a freehub with a cassette. Threaded hub has threads for screwing the freewheel on. The freewheel holds a cluster of sprockets and a ratcheting mechanism that allows free backpedaling (and coasting), while locking when pedals are turned forward, driving the rear wheel. Freehub has installed cassette holder with splines, and a ratchet mechanism. This patent allows for a more precise machining, allowing the cassette to be totally perpendicular to the hub axle, i.e. being parallel with the rear wheel. Thread-on frewheel can never be this precisely parallel, because it is very hard to machine threads on both the hub and the cassette to reach perfect alignment when screwed together. 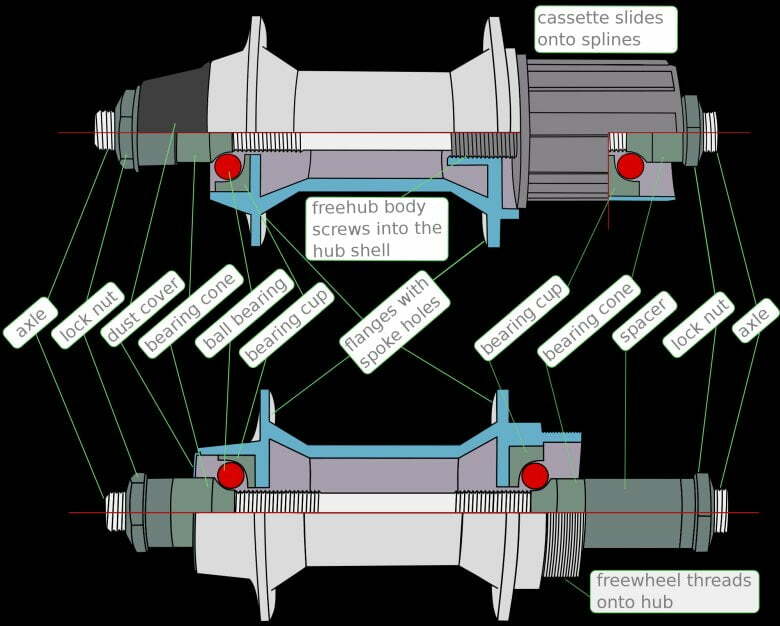 Freehub and freewheel hub comparison. Note the distance of bearings (red). Freehub has a lot more stable and secure design, with bearings at the very ends of the hub. 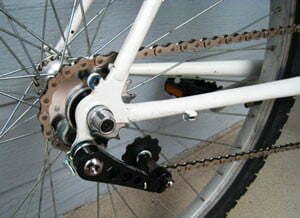 The spot where hub takes the most torque is where the sprockets are mounted and pulled by the chain. Freewheel hub has bearings placed almost in the middle of the hub, giving long leverage for sprockets to tug the axle. That is why hubs with freewheels were known to experience broken axles, especially with larger number of sprockets (therefore longer part away from the right bearing, giving stronger leverage to break the axle). 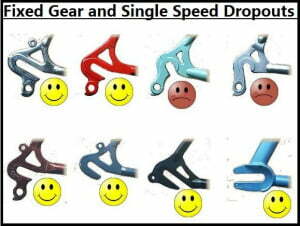 This standard should be limited to 6 sprocket freewheels, maximum 7. Anything over that number (wider cluster of sprockets) is very likely to cause breaking the rear axle. Hub with threads and mounted frewheel (with sprockets). Spockets are just slided onto the freehub, then locked in place with the lockring. There is another variation in standards. Typical road bike rear hub is 130 mm wide, while MTB freehub is a little wider: 135 mm, allowing more lateral strength. Newer standard of MTB rear hubs for extreme riding condition is made even wider (with matching frames with wide dropouts), so the wheels are even stronger. There are now: 142, 148, 150 and even 158 mm wide rear hubs! Old standards are 120, 126 mm etc. Width measured is the outer one of hub parts that face the inside of the dropouts. 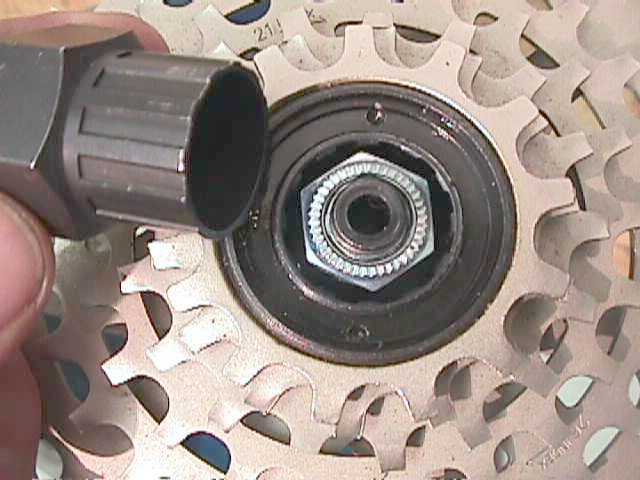 Term still used for this dimension is “OLD” (Over Locknut Distance), although many modern hubs with “industrial” bearings don’t have locknuts. On cup and cone hubs (that used to be the only available in the past), the outer most nuts were used to lock the cones in position by counter-tightening them, so they were called “locknuts”. Nuts holding the hub in place and the axle width are not measured. Only the distance that stays inside the frame dropouts. 8 and 9 speed hubs have the same spline width, they are 100% compatible. They can take a 10 speed cassette with using a 1 mm wide spacer ring. 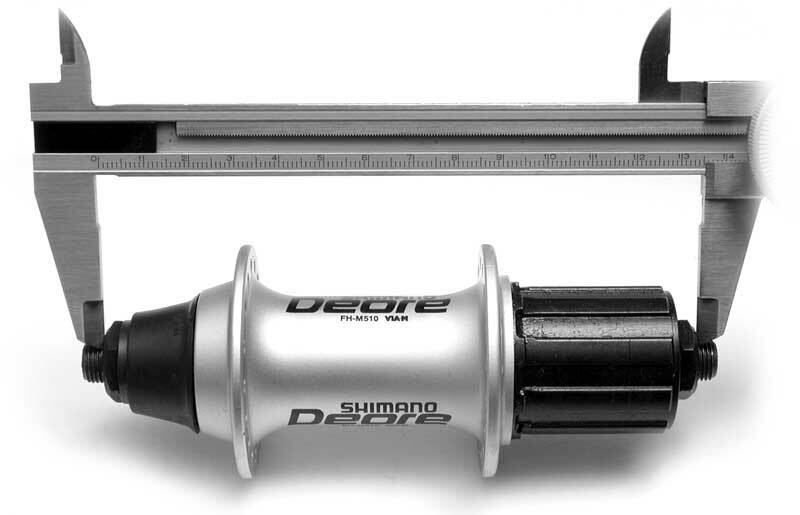 There is a special Shimano 10 speed only hub (rare), that is too narrow for any other but a 10 speed cassette – both road and MTB. 10 speed cassette is narrower than 8, 9 and 11 speed one. This freehub was manufactured for a short period, but is no longer popular. 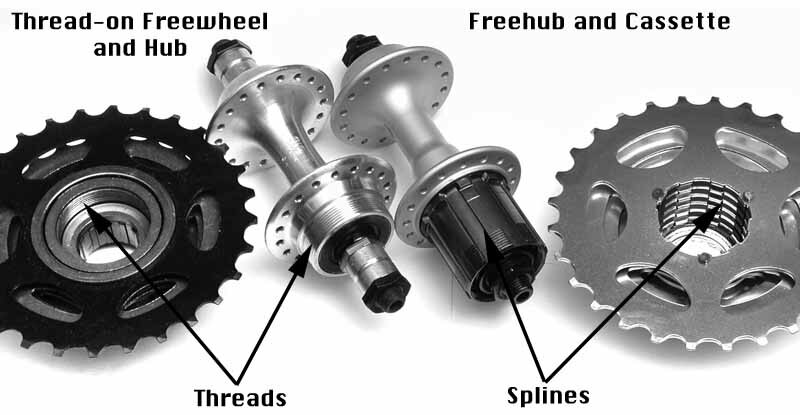 11 speed MTB freehubs are the same as 8 and 9 speed ones. 11 speed MTB cassette is as wide as an 11 speed road cassette, but the biggest sprocket (nearest to the spokes) has it’s inner part (the one close to the hub) a bit cut out, so that the cassette can sit closer to the wheel, going a bit over the hub. 11 speed road freehubs have wider splines than all the others. 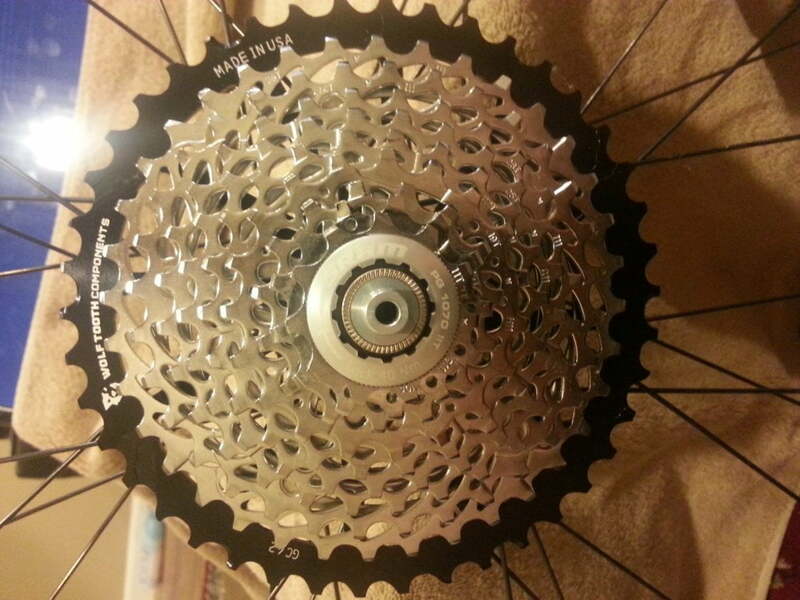 In order to use 8/9 speed cassette on this hub, a 1.8 mm wide spacer is required. For mounting a 10 speed cassette, an additional 1 mm spacer is needed (the one used when mounting 10 speed cassette on 8/9 speed freehub). So 1.8 mm + 1 mm. New Shimano and SRAM freehubs, mostly intended for 11 and 12 speed 1X (single front chainring) systems have their own freehub and cassette designs, that can’t be combined with any others. These are SRAM XD and Shimano XTR M9100 “SCYLENCE” freehubs. As well as oncoming (spring 2019) Rotor’s 13 speed freehub. For more detailed info on mix-matching freehubs, cassettes and other components, see the posts in bicycle components compatibility section. of cheap transportation, these bikes were among some of the first “comfort bikes. * You’re bored with your current home gym equipment and are looking for something interesting and fun. This way you get your money back after some years and save even more in the long run.